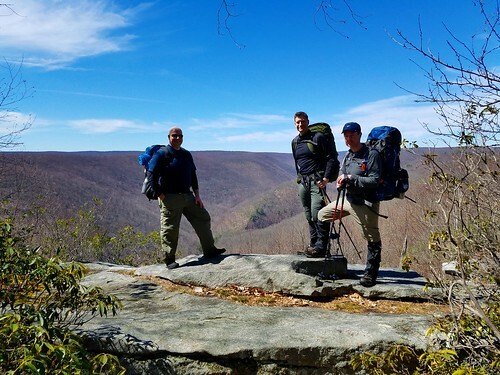 A few weeks ago I met up with some friends from college for our regular backpacking trip. We headed further west this time, to the Black Forest Trail (BFT). We began at Slate Run to do a loop of about 20 miles or so along the BFT and side trails. Our route followed the BFT counterclockwise from Slate Run, left on Francis Road, left on Old Supply Trail, right onto the BFT, straight onto Manor Fork Road, left onto Gas Line Trail, straight onto BFT, straight onto a yellow trail, left onto Naval Run Road back to the parking area. This loop offers some of the best views of the BFT, waterfalls, great camping, without being too challenging. The weather was incredible, with sunny skies, warm temperatures, and a nice breeze. The climb from Slate Run is long, but gradual as it follows a narrow ridge with views through the trees. At the top we enjoyed a couple of fine views over Slate Run gorge. 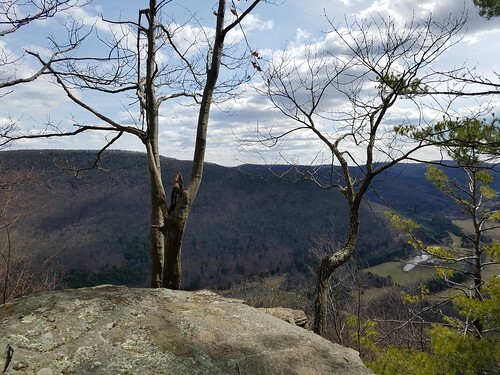 The trail meandered through a forest with extensive mountain laurel and rock outcrops with more views. We reached the top of Red Run at another beautiful view over the deep gorges and large rocks on the far side of the gorge. The descent was steep and rocky, but the scenery was excellent with many waterfalls and cascades over the large rocks and boulders. We hiked along beautiful Red Run, passing campsites above the rushing water. We reached Slate Run, as the sounds of rapids filled the forest. 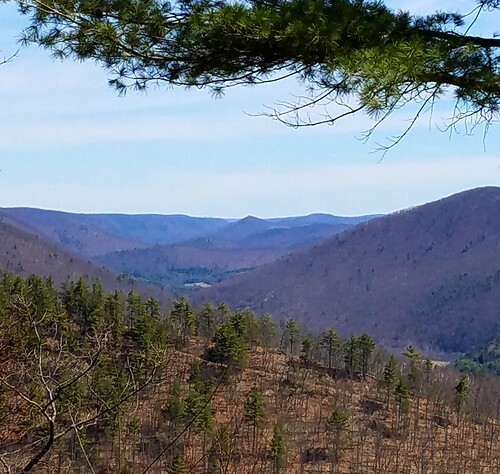 We climbed, leaving the BFT, and turned left onto Francis Road, passing a few more views, and then we descended to Slate Run Road. We turned left onto the blue blazed Old Supply Trail as it followed sidehill up above Manor Fork. It appeared the trail was being worked on with new sidehill. The blazes became infrequent, but the trail was obvious. As we neared Foster Hollow, the trail was hard to follow; I recommend you stay near the creek. We camped at the bottom of Foster Hollow at a nice site. 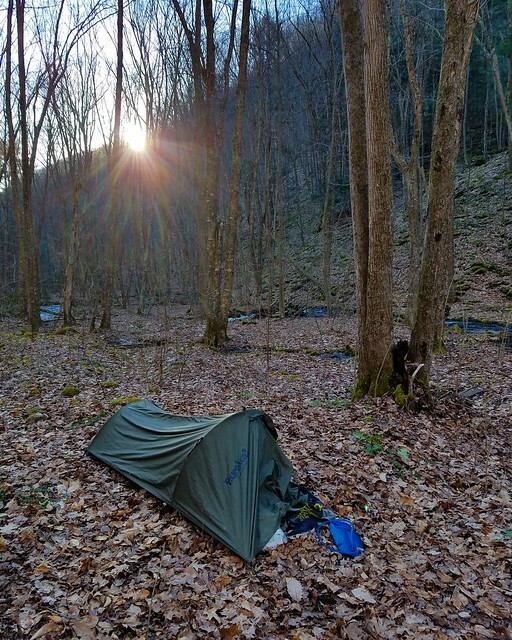 The sun returned the next morning as birdsong filled the forest and frost covered our tents. We climbed up Foster Hollow with its cascaded over mossy rocks. It was a scenic trail. We passed two guys camping and soon turned right onto the BFT. 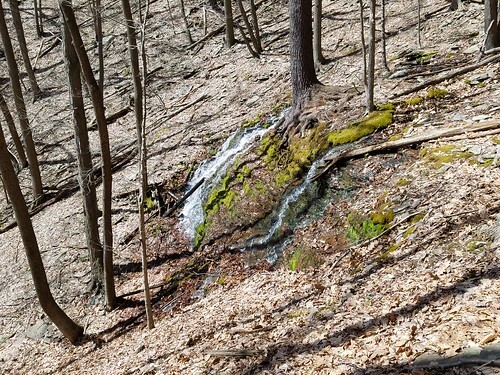 A steep climb ensued through a beautiful hemlock forest and a spring bubbling out the ground. At the top, the trail leveled and soon entered a beautiful pine forest with another spring and campsite. A roadwalk followed on Manor Fork Road, a gravel road to the Gas Line Trail. 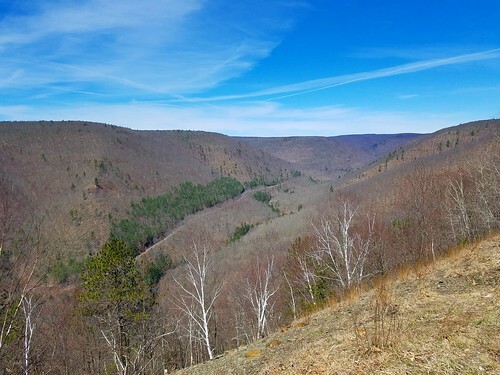 The trail soon returned us to the BFT along a ridge with many vistas of the Pine Creek Gorge. The views were beautiful in the bright sun. 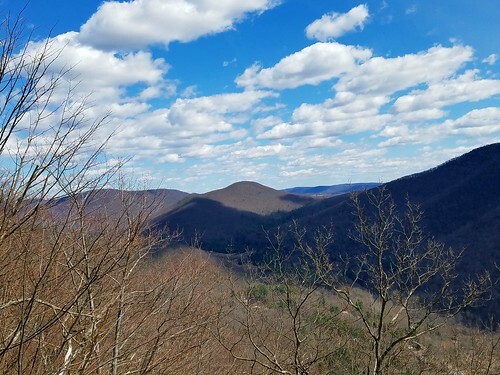 Matt and I even walked on the Jerard Trail a short distance off the BFT to see the Stone Seat vista and its view of the distinctive peak of Gillepsie Point in the distance. As we descended, we passed more views and then the trail steeply switchbacked down to Naval Run. The mountains really looked rugged and imposing as we descended. We checked out Naval Run Falls from above and then took a yellow blazed trail to Naval Run Road, which we followed to the parking area. The BFT is a beautiful trail and I think everyone enjoyed the hike. This loop includes a lot of the BFT’s highlights without being too hard. It is a nice option for those not wanting to do the entire loop. We celebrated at the Hotel Manor with a meal and beverages, surrounded by the gorge as fisherman stood in Pine Creek, trying their luck. It was great to be back on the BFT in the beautiful Pine Creek region. After hiking to Rattlesnake Point, I traveled to Wallis Run to check out a loop combining the Matt Mertes and Weitzel Hollow Trails. I parked along Wallis Run Road right before the temporary bridge. A better parking area is where the Weitzel Hollow Trail meets at Wallis Run Road. The Matt Mertes Trail makes it way up a slope under hemlocks; some trees are quite large. The trail crosses a narrow powerline swath and continues the climb through a scenic forest. I turned left to continue the climb, and the terrain become rockier and steeper. Several large hemlocks had died from the wooly adelgid. I reached the ridge where the trail leveled and then descended through laurel. The trail turned right and climbed gradually, staying close to the edge of the plateau in a scenic pine forest. I passed a nice view of the mountains and countryside and continued the climb through laurel and over rocks. 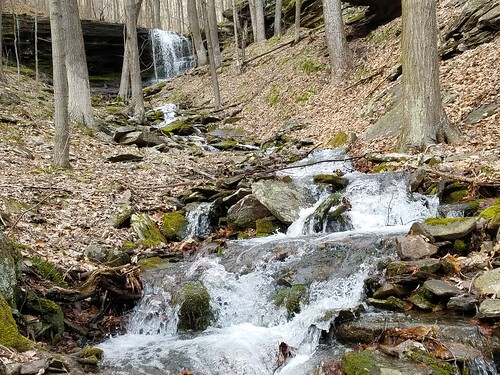 The trail then began a gradual, rocky descent into a stream valley where it ended at the yellow blazed Weitzel Hollow Trail, a scenic spot that felt more isolated than it was. Here I turned left and descended along the yellow trail in a deep, wooded valley. At first, the trail was in the streambed but soon followed an old grade on the left. The creek was scenic with many cascades and pools. One part of the grade was washed out due to a flash flood in the Fall. The hike along the Weitzel Hollow Trail was enjoyable and ended at Wallis Run Road where there is a sign and register. This is the recommended place to park. I then walked the road a short distance back to the car. This enjoyable loop is about three miles and is a bit of a workout. 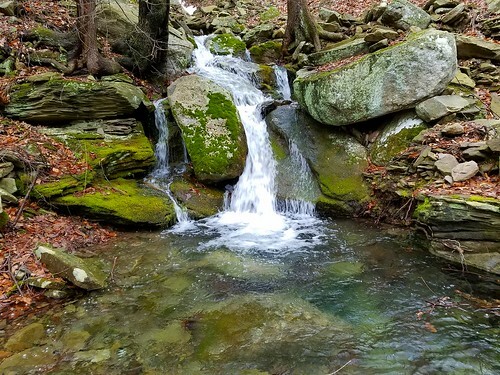 It is rocky and a little steep in sections, but features hemlock and pine forests, a view, and beautiful stream side hiking with cascades and pools. 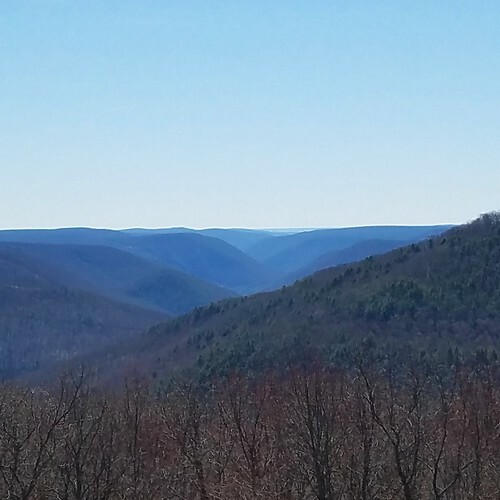 Another fine hike in the Loyalsock State Forest. 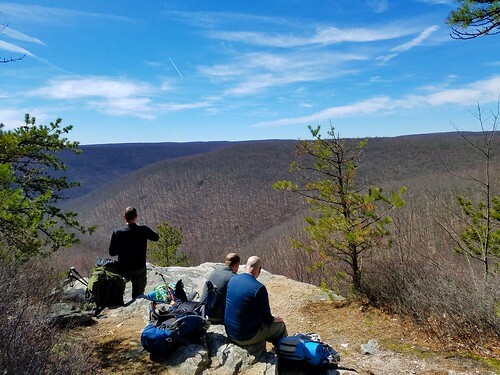 Many years ago I joined a guided hike with the Alpine Club of Williamsport up to Rattlesnake Point in the Loyalsock State Forest, across from Camp Susque. After getting a recent map, and hiking to the nearby Lookout Rocks last year, I decided to return. 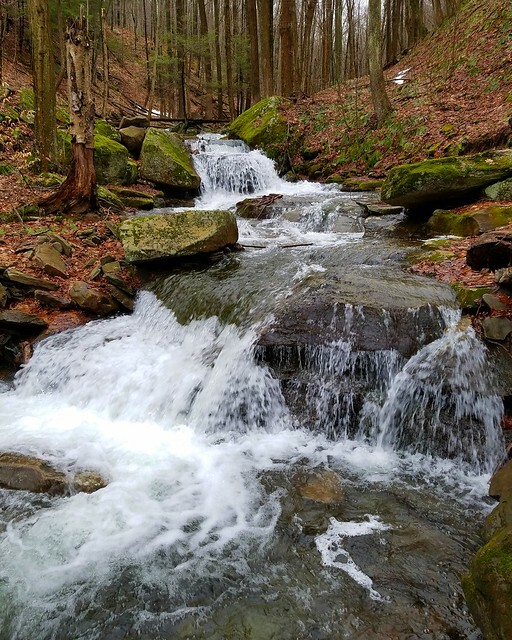 My original plan had been to find some waterfalls in the state forest near Wallis Run, but with several roads closed, I ended up on PA 14 and decided to check out Rattlesnake Point instead. The hike begins along PA 15, right where Susque Road meets. There are some places to pull off and park along Susque Road. Camp Susque is unique in that it allows the public to hike the trails on camp lands, just sign in first at the camp office. The beginning of the hike is on camp land, but most of it is on state forest. I crossed PA 14, turned right onto a mowed path and reached a trail sign and trail, marked with grey blazes. The footpath is fairly evident, comprised of narrow sidehill, as it went below some ledges and into a stream valley with laurel. I crossed the seasonal stream, flowing on my hike, and was soon greeted with a gorgeous twenty foot falls and an overhanging ledge. The ledge was broad and springs cascaded on the other end. The trail continued up the steep glen with tulip poplar trees and other hardwoods. The switchbacks soon began. This trail is filled with switchbacks that climb steeply up the glen. The trail comes close to a second falls, but you must go off trail to see it. 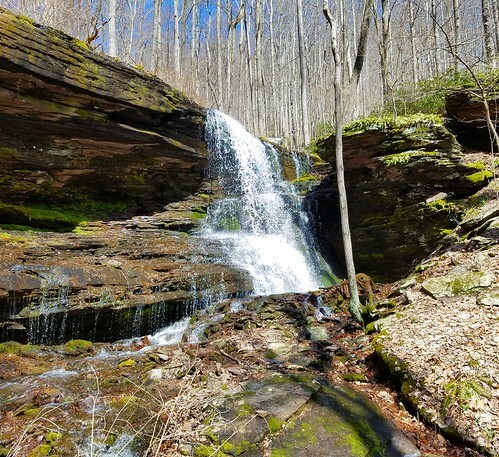 It is an odd falls, flows out of the ground at the top and then disappears at the bottom over a ledge of moss with a large pine tree growing on the top. The switchbacks continued over rocky slopes, along some ledges, through some laurel, and then reaches the vista. It is an impressive view, about 1,000 feet above the valley floor. 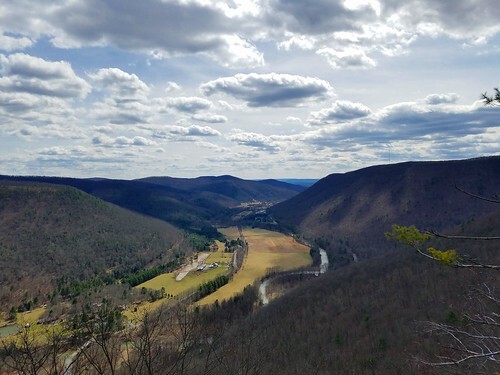 Steep mountainsides surround the valley, through which the Lycoming Creek twists and turns. I was also able to look almost straight down on my car through the bare trees. I could see for about 20-25 miles. The length of the trail is about 1.5 miles. And no, I didn’t see any snakes. 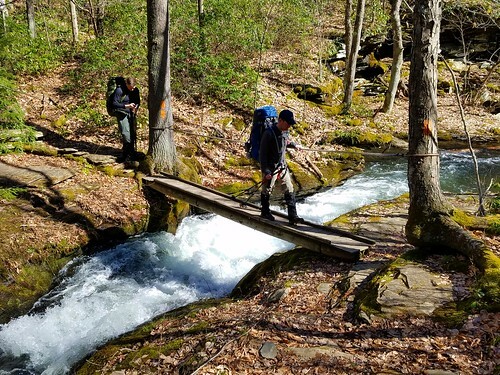 This is a beautiful and challenging trail, made even more scenic when the creek is flowing. Hiking to Rattlesnake Point is easy. 1. Register at the Camp Susque office. 2. Park on Susque Road, before it meets PA 14. 3. Cross PA 14 and bear right onto a mowed path. 4. The trail begins at a trail sign. It climbs about 1,000 vertical feet in a mile and a half. 5. Trail is blazed grey, so it can be a little hard to see some blazes, but the path is noticeable. 6. Trail crosses a small creek twice. 7. Trail follows many narrow switchbacks and the terrain does get rocky. Rocks are loose. 8. View is beautiful, but be careful, it is at a cliff. 9. Return the way you came. SGL 57 is becoming well known for its wilderness, diversity, and places of beautiful scenery. It is also home to a number of waterfalls. 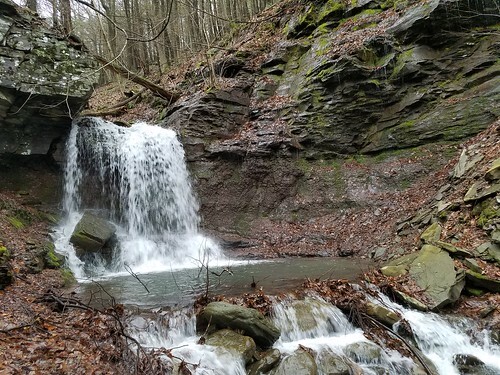 I recently decided to do an afternoon hike to check out two of its little-known waterfalls which are not on any map, Koerber and Cali Falls. I parked along Windy Valley Road at the bridge and made my way through the woods and up a steep bank. I found an old woods road on the south side of an unnamed stream, as it tumbled down through a deep gorge with cascades, slides, and pools. I soon reached a falls no more than ten feet high. The old road crossed the creek and I turned right off the old road and proceeded up the creek, where Koerber Falls soon came into view. Thanks to recent rain and snow melt, it was a powerful torrent of water surrounded by dripping red cliffs clothed in moss. A pool was at the base of the falls. In low water, it is equally scenic, becoming a graceful spout. Winter brings impressive ice flows. I enjoy these falls due to their power and an almost unbroken sheet of water. I’ve previously hiked further up this creek and did not see any other waterfalls. Koerber Falls flows most of the year and is about 15-20 feet tall. I made my way over to Scouten Brook with its bedrock rapids, pools, cascades, slides, and boulders-a truly beautiful stream. My goal was Cali Falls. I hiked up the brook and soon followed an old grade on the south side of Scouten Brook. Through the bare trees I kept an eye out for a glen that came down on the north side of the brook. I made my way down the steep slope back to Scouten Brook, filled with cascades and rapids with crystal clear water, and crossed it. I made the steep, rocky climb up the unnamed tributary, which was flowing well. Cali Falls soon came into view as it plummeted with a curtain of water in a bedrock grotto into a pool. This falls is unique in that you can go behind it. Cali Falls is about 25-30 feet tall. It is in a wild, rugged, isolated spot that few have seen. 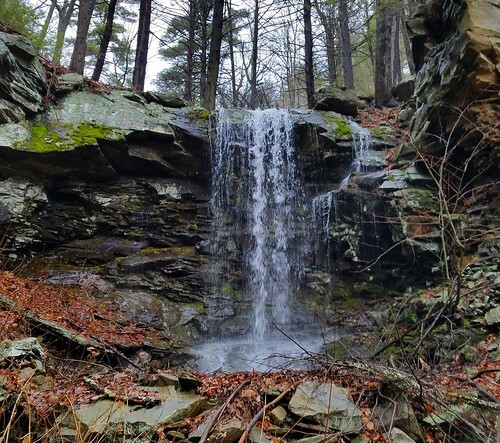 It was beautiful to look up from Scouten Brook to see this waterfall through the bare trees. Cali Falls does dry up in summer or periods of little rain and it also features ice flows in winter. I made my way back down the mountain trying to keep ahead of the twilight. No official trails reach these falls, although old grades do get fairly close to both. Avoid using Scouten Brook Road to reach Scouten Brook or Cali Falls, as it is a private road. SGL 57 does reach Windy Valley Road just north of Scouten Brook Road, so that is a way to reach Cali Falls and Scouten Brook. 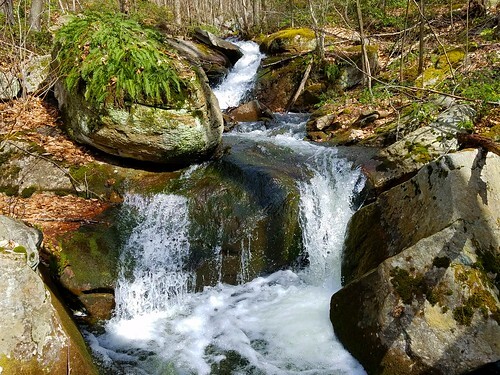 Expect wet feet and stream crossings on this rugged, off trail hike. Be careful crossing the streams, particularly Scouten Brook, in high water. GPS coordinates below are from Google Earth and are approximate. I was in Alabama for a child abuse conference, so I tried to make some time in the evening to see some of the sights around Huntsville. Huntsville is a very nice city and northern Alabama has some beautiful places. I visited the NASA Museum and the Huntsville Art Gallery, but the highlights were the Walls of Jericho and the Sipsey Wilderness. One of Alabama’s premier hiking destinations, the Walls of Jericho is a limestone gorge with seasonal waterfalls that disappear underground. The trail is about 3.5 miles one way. I flew down early on Sunday, so I had time to hike the entire trail. There were many cars in the large parking area and I was soon on the trail as it descended along long switchbacks. Springs bubbled from the ground and there was a large sinkhole, illustrating the karst topography. The forest was almost completely hardwoods, with a beech understory, reminding me of PA’s forests. I reached the bottom, a descent of about 1,000 feet, and crossed a large, swollen stream over a log bridge. There were some wildflowers, including bluebells. Several hikers mentioned to me the falls were flowing good, which is apparently a somewhat rare sight. The trail crossed another creek over a log bridge and passed some backcountry campsites. I soon passed an old cemetery. It is hard to imagine people lived, worked, and died in this isolated place, but the meadows and old grades showed otherwise. The trail entered a gorge and became rocky and slippery. The clay soils on the trails makes it quite slick when wet. Rapids roared below as the gorge walls closed in. I crossed into Tennessee and soon reached the Walls of Jericho. Towering limestone walls rose over the creek was slides and waterfalls. The creek was swollen, and there was no bridge, so I waded across the creek as springs flowed out of the cliffs. A gushing falls erupted right out of the cliff walls, as a smaller falls tumbled down the exposed, bedrock streambed. In highwater, the creek flows down the streambed, but otherwise it flows underground. I scrambled further up the gorge over the limestone from which springs flowed and then disappeared. I reached the main falls which fell into a pool of water, from which no water flowed. The water flowed underground and re-appeared as the falls I passed previously. I couldn’t go further so I turned around for the long climb back up. As I hiked up, I heard a tree somewhere in the forest gradually crack, after a minute of occasional cracks, it fell to the forest floor with a thud. The Walls of Jericho is a beautiful, unique place that was well worth the visit. I then stopped by Monte Sano State Park adjacent to Huntsville. I didn’t have time to hike, but I did see a nice vista of the rolling mountains. The Sipsey is a beautiful place that should be on anyone’s list to visit. I didn’t have time for long hikes. I love places like the Sipsey; from the road it doesn’t look like much, but once you start exploring, you see how special it is. Places of hidden beauty always hold a certain fascination for me. It’s easy to appreciate the obvious beauty of the Grand Canyon, Yosemite, and Zion, but places like the Sipsey conceal their beauty in the shadows and under the trees, and it is just as rewarding. 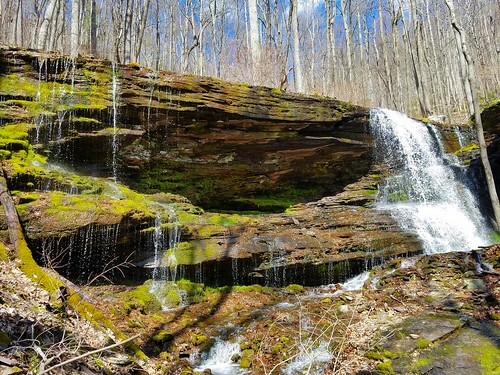 The Sipsey is a low plateau with a thick layer of sandstone eroded by the Sipsey River and its tributaries, creating extensive gorges with hundred of miles of cliffs and ledges, home to countless waterfalls when there is a lot of rain. There are rock shelters and overhangs. 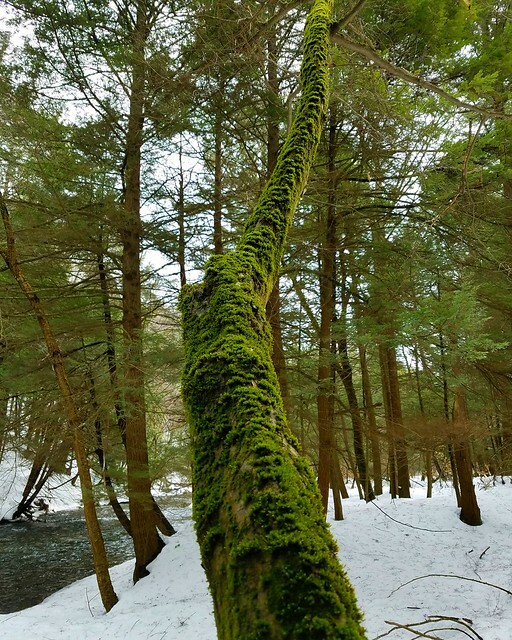 Some old growth forests are deep in the gorges. My first visit was to Caney Creek Falls, south of wilderness area. I parked at the trailhead and a lady on the porch of a house across the road waived at me. The trail was about a mile and descended to the creek with a beautiful twin falls. The larger falls fell over an overhanging ledge, so I was able to walk behind the falls. The setting was very scenic as the broad curtain of water fell into a deep pool, adorned by the ledges and large boulders. I was surprised to see mountain laurel and hemlocks growing along the creek. I then drove to the Sipsey Picnic Area to explore the different grottos, gorges, and falls above the Sipsey River. Thanks to the recent rains, each gorge had a falls. Large cliffs surrounded the creeks, dripping with springs, making it appear to be raining, despite it being a sunny day. Moss, lichens and ferns draped the cliffs and ledges, as hemlocks grew among the shadows. I could hear the chatter of a kingfisher. As twilight descended, I hiked an unofficial trail up another gorge to see another falls, but didn’t see it due to darkness. Regardless, several other falls tumbled over the cliffs. I returned to my car in the dark. I hope I’ll be able to visit the Sipsey again. After the epic snowfall, a bit of cabin fever began to set in, so we were excited to do a hike. The snow seemed to have melted a bit, or so we thought. 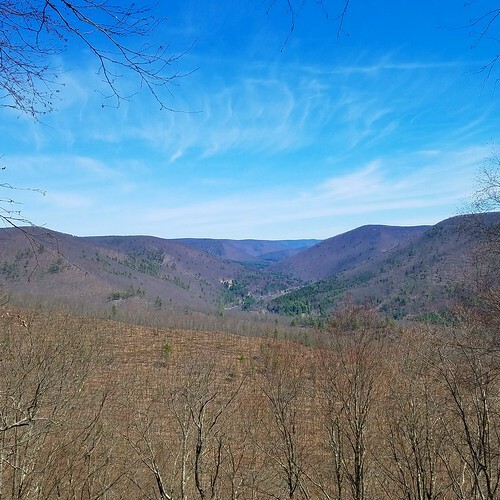 We decided to hike a new trail that connects Lackawanna State Park to the Countryside Conservancy’s Messimer Preserve along the scenic South Branch of the Tunkhannock Creek. We parked at a small lot along Cole Road, crossed the bridge and turned left onto the trail as it went along the edge of a field. At the end of the field, there was a sign and we entered the scenic hemlock forests along the creek. I did not notice any blazes, but the trail path seemed evident. The snow was also a lot deeper than I was expecting. 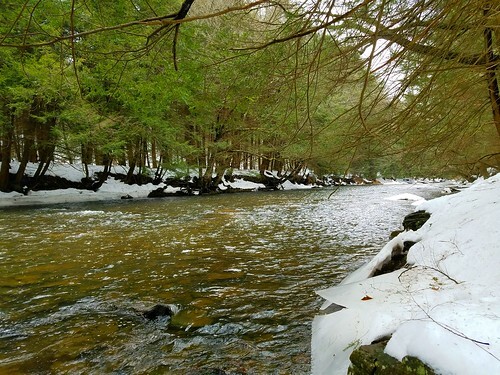 The scenery was excellent as the large creek tumbled over riffles and around boulders under the hemlocks and pine. What a place to hike on a hot summer day, I thought. It was noticeably cooler in this deep, shaded glen along the creek. We reached a powerline swath and here it got a little confusing. The trail goes up the swath a short ways and then continues along an old grade higher above the creek. It was still a nice hike, although the floodplain along the creek is worth exploring. 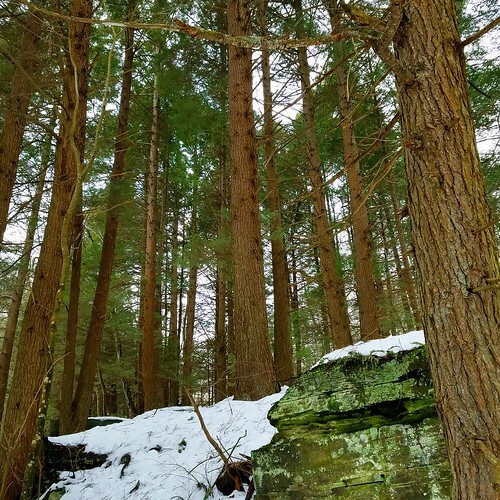 The trail entered the Messimer Preserve and a scenic hemlock forest returned. We reached an old quarry and abandoned road that came down from the right. We followed straight on the old grade to a private property line. Back at the quarry, an old grade descends to the creek; I recommend you take it. 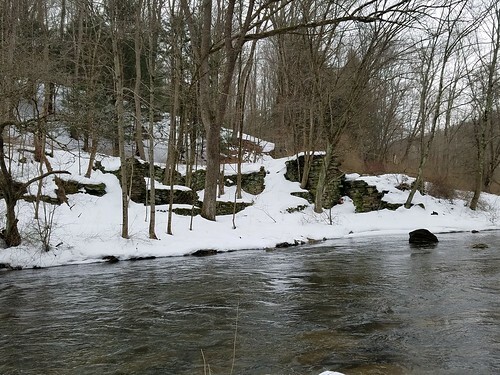 It explores the creek and more hemlocks with ruins of an old mill across the creek. We then retraced our steps. The South Branch Trail is a great hike, and fairly easy. Hiking along the creek was beautiful and this trail had more of an isolated feel than others in the park. It is definitely worth a visit the next time you’re at the state park. More info about the Countryside Conservancy.